Leapin’ Leprechauns! 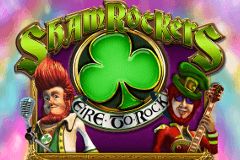 Shamrockers, Eire To Rock is an Irish-themed pokie with a difference, as it’s filled with musical mayhem as the 4 members of a band drum up some wins across 5 reels and 20 paylines. A highlight of the performance is a free spins game with a richer mix of symbols, and a rewarding Encore round, plus there’s a lucky wild symbol and even a jaunty soundtrack to help create the atmosphere of a fun night filled with Irish music. Developed by IGT, Shamrockersis designed in a cartoon style and sets the reels on an outdoor stage with the rolling hills of Ireland behind them. The game title, written in a font that goes with the theme, sits above, and below the stage we see the control panel where players can adjust their stakes from a minimum of 0.20 to a maximum of 40.00 per spin. The 20 paylines are all permanently active, and the basic wins are formed by lines of 3, 4 or 5 of a symbol type landing across any line, on connected reels running from the left side. The same font as the title is used for the lower value symbols, which, as with many games, are made up of the playing card 10, J, Q, K and A. Just 1x the amount bet on a line is returned to players who land the 10 across reels 1, 2 and 3, while seeing 4 at a time will pay out 10x and a full line of 5 will be worth 20x. Going up in value, the J, Q and K will each win progressively more and the A, naturally, is the most valuable card symbol, at 3x, 15x or 30x the line bet. It’s the band members who make up the top part of the paytable, starting with a red-bearded violinist who will pay out 10x, 25x or 75x when he lands on 3, 4 or 5 reels, followed by the lady playing a flute, a cool-looking guy in guitar and lastly, the lead singer, with his huge mass of red hair, who is valued at 15x, 60x or 500x. A four-leaf clover is traditionally associated with good luck, and players should have the luck of the Irish with them when this symbol appears, as it’s a wild and can substitute for all others, except for a bonus symbol. It can therefore make it easier to complete winning combinations, if for example, the J was on a line on reels 1 and 2, and the wild in the right position on reel 2, then it will act as another J and pay out accordingly. It’s also possible for it to turn winning lines of 3 or 4 symbols into higher-paying lines of 4 or 5. The bonus symbol is shown as a ticket to the show, and although it only appears on reels 2, 3 and 4, whenever it lands in any 3 or more positions on them, it pays 2x the total bet amount and then a free spins game is triggered. Initially, there’s just 4 spins, which is a very low number, but players could be dancing a jig or two when the extra features of the free spins round come into play and the potentially big rewards are claimed. On the first free spin, the violinist is stacked on the reels which gives players an excellent chance to collect wins, while the flutist, guitarist and singers will be stacked on spins 2, 3 and 4 respectively, so as the round progresses, even bigger payouts are likely. On the fourth spin, a golden VIP ticket can turn up and award an Encore free spins round, which is simply a further 4 spins where the whole process repeats itself. This ticket will turn up around half the time and it’s possible to retrigger the free games over and over to an impressive maximum of 240 spins. This is certainly a fun-looking game, with the band members all being very well designed and the overall theme enhanced by the background image. The playing card symbols may be a little overused here, but it’s not going to get in the way of players being able to land lots of winning spins, and that lucky wild symbol is going to help quite a bit. Although the free spins game may look like a short bonus round, it can be retriggered several times over, but players will be very lucky indeed to get the full complement of 240 spins. The stacked symbols should ensure that they don’t end the round empty-handed however, and overall this is an enjoyable pokie.